There’s a very good chance that most diehard Star Wars fans are going to love The Force Awakens. They’re going to love it because it’s been made to their exact specifications, relayed through years of constructive criticism and very vocal bellyaching. Gone are the senatorial tariff debates, slapstick alien mascots, and stiff Jedi banter that characterized George Lucas’ commercially successful but widely maligned prequel trilogy. As directed by professional franchise custodian J.J. Abrams, this seventh installment goes back to the basics of what made the series the most popular in movie history. 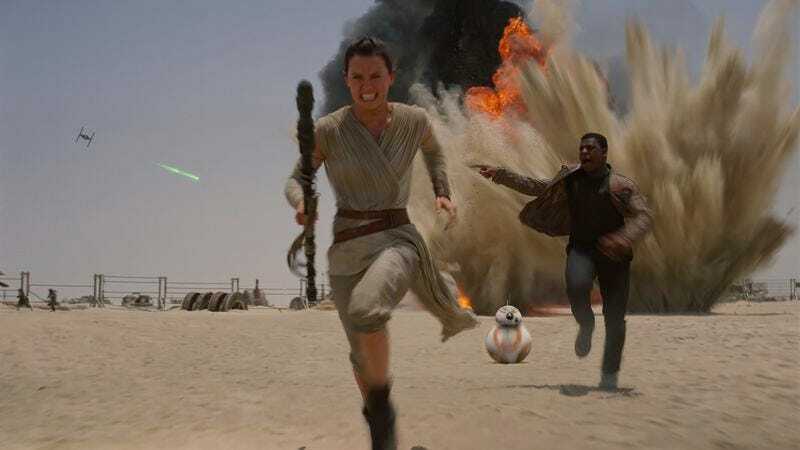 Like, all the way back: The Force Awakens borrows so much from the 1977 original—environments, relationship dynamics, action scenes, even a basic plot structure—that it often resembles a remake as much as a straight sequel. But for plenty of viewers, any misgivings about originality will go out the window the minute Han Solo and Chewbacca saunter back into the Millennium Falcon, or that rousing John Williams score rises over new images for the first time in a decade. Made without Lucas’ involvement, The Force Awakens is a state-of-the-art throwback, both retro and post-modern in its self-awareness. It doesn’t just know that it’s operating in the long shadow of a classic; it hardwires that understanding into its own DNA, making legacy a prevailing theme. The Star Wars movies build myths on top of myths on top of myths, creating a universe where future legends are always nipping at the heels of established ones. Here, in what amounts to Abrams and company’s smartest play, the characters themselves are basically Star Wars fans; they speak in hushed tones about the events of the original trilogy, just as Luke Skywalker and his crew hung on stories of how a great Jedi turned to the dark side. Hell, even the villain of The Force Awakens has done his homework: Dressed head to toe in black, with a mask to go with his James Earl Jonesian baritone, he’s got serious Sith envy. Is that saying too much already? Abrams and his corporate overlords at Disney have been protecting story secrets with the iron fist of the Empire. But this is a Star Wars movie; setting aside the big reveals no responsible publication would disclose, the plot is pulp simplicity itself—and all the more incidental for how often it repeats the arc of A New Hope, beat by beat. There’s a new confederation of the dark side called The First Order, led by that aforementioned Vader groupie and stocked with enough Stormtroopers to turn an alien village into a killing field. There’s a heroic resistance, putting flyboys like Oscar Isaac’s sardonic Poe Dameron into dog fights with the enemy. And there’s a quiet early stretch on a desert “junkyard” planet that looks exactly like Tatooine but isn’t, where we meet our hero, a plucky scavenger named Rey (Daisy Ridley). This is where hiring back Empire Strikes Back author Lawrence Kasdan, who co-wrote the screenplay with Abrams and Michael Arndt, really pays off. It’s a testament to the nimble scripting that the new characters take shape so quickly, elbowing their way into a ensemble of returning fan favorites. Rey, at this early stage, isn’t much more than a beacon of raw promise, but Ridley gives her a spark of good-natured determination; she has personality—never a given in Lucas land—and she’s just as capable with a bow as a saber. Her counterpart, in another victory for the diversification of this series, is turncoat Stormtrooper Finn (John Boyega), who flees the life of killing he was born into. The Force Awakens under-dramatizes this enormous moral decision, but it also allows Boyega, star of Attack The Block, to play Finn as a kind of charismatic dork, quick with the nervous jokes and smart enough to know that he’s in way over his head. Even the big bad has depth; you want to laugh when he takes off his helmet to reveal Girls star Adam Driver, until the actor conveys an unnerving vulnerability to go with his character’s volcanic temper. The Lost creator does have a weakness for winking callbacks, which can be good for a laugh, as when Rey dismisses a certain iconic ship as old “garbage,” but can also lead to instances of glib pandering. (As in Star Trek Into Darkness, which was a clear dry run for this gig, Abrams botches his most potentially affecting scene by turning it into a big re-creation of one of the franchise’s most famous moments.) But his affection for his adopted sandbox is never less than clear; if The Force Awakens often feels like savvy fan service, shuffling through a greatest-hits collection of familiar scenarios, it also plays most of its grace notes with honesty. Yes, putting Harrison Ford back in that old jacket (”It’s new,” Han insists) is a foolproof recipe for applause. But there’s nothing canned about the older, wiser charm the actor brings to this aged Han Solo, and seeing the character reunite with Carrie Fisher’s battle-hardened Leia doesn’t lose any of its poignancy for being an easy lay-up. What Abrams has done is strip Star Wars down to its core components, rearranging the stuff people liked about the original trilogy and getting rid of what they hated about the rest. (Don’t hold your breath for a Jar Jar cameo, in other words.) But the prequels, misguided as they often were, dared to be different, to be their own movies. 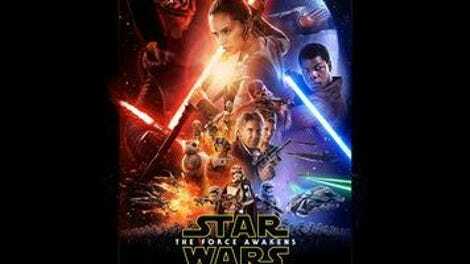 The Force Awakens never reaches the heights of escapism Lucas once did, mostly because its pleasures are echoes; by the time our posse walks into a saloon that’s just the cantina in a nicer neighborhood, the déjà vu factor begins to feel as much like a drawback as a benefit. Maybe the cyclical nature of the Star Wars universe—the constant teetering between dark and light, the rebalancing of the Force every other decade (or sequel)—excuses the recycled nature of the movie’s fun. Or maybe innovation is overrated when it comes to a mass nostalgic event like the return of the Jedi. But if we’re destined to see more and more episodes, multiplying into an endless horizon like that mandatory opening word crawl, let’s hope they find a few unexplored corners of the galaxy far, far away. Fans might love that, too. For thoughts on, and a place to discuss, plot details we can’t reveal in this review, visit The Force Awakens’ spoiler space.